Frankly, I was unable to fully understand (much less appreciate) the significance of what Joseph A. Schumpeter shares in his masterwork, Capitalism, Socialism and Democracy, when I first read it in 1975. Only much later, after several re-readings, have I begun to “get it” in terms of what “creative destruction” is and isn’t. I mention all this by way of introducing my gratitude to Michael E. Raynor for what I have learned from him in The Innovator’s Manifesto as well as from books written or co-authored by Clayton Christensen, who wrote the Foreword to this book. For me, one of the most valuable “lessons” is that “creative destruction” is the means and “creative creation” is the ultimate objective. Whereas Charles Darwin explains evolution as a process of natural adaptation and elimination, what Raynor examines in this book are deliberate efforts to survive and then thrive. 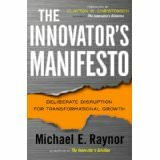 He asserts, and I agree, that “deliberate disruption” is the key to “transformational growth” by both individuals and organizations. In Part II: Explanation (In Chapters 3-5), he makes the case for “generalizing beyond the experimental sample and suggests that Disruption can be used to do more than merely `pick a winner,’” although that is obviously a substantial benefit.